Hisamitsu Pharmaceutical Co., Inc., the manufacturer, distributor, and brand owner of Salonpas® (Head office in Tosu City, Saga Prefecture, Japan) announced that Euromonitor International, an international leading market research company, had acknowledged that Salonpas® is the world’s No.1 brand of OTC topical analgesics in patch format and Hisamitsu Pharmaceutical has been awarded a certificate of the acknowledgement on May 18, 2017. 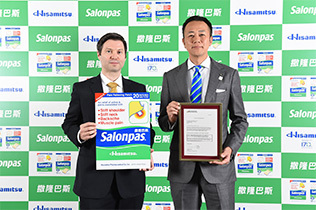 May 18 is the “Salonpas® Day” which has been certified by the Japan Anniversary Association as the Japanese sound of the day can be mean as “Relieve stiffness”. We set “improving quality of life of people around the world” as our basic principle and will make the best effort to expand our business operations worldwide. Our mission is to “bring patch culture to the world”. The acknowledgement as the world’s No.1 is based on the results of the custom global market research on sales which was conducted in March – April this year (2017). 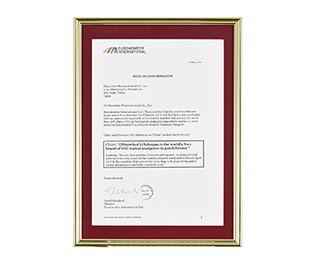 Euromonitor International Limited. is a British company headquartered in London and it is a leading company in international market research with its exclusive researchers in over 80 countries in the world. Based on the global market research on OTC topical analgesics that Euromonitor International conducts, the company has conducted a research specifically focused on the patch brands. In the countries for more than 70% share of the global topical analgesics/anaesthetic market in 2016, -- the research company conducted trade interviews of manufacturers and wholesalers, visited retail outlets for store check, and compiled the sales figures of patch products by country and brand and calculated the sales shares.